If you’ve tried other fitness programs or weight loss plans that didn’t live up to the hype, you’re not alone. Most programs available today don’t work because they’re not complete systems. 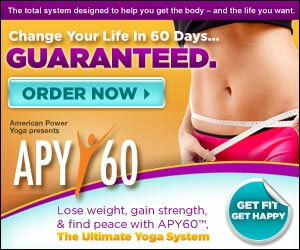 APY60 The Ultimate Yoga System is just that, a complete system designed to change your body and your life in just 60 days, guaranteed. 60 DAILY BLENDS, including day-by-day coaching and conditioning by Kurt himself to ensure your success. 10 AMERICAN POWER YOGA CLASSES with Kurt that are easy to follow, fun and work to sculpt your body and eliminate stress. STEP-BY-STEP WORKBOOK to chart your workouts and measure your results. A NUTRITION GUIDE filled with tips and great tasting recipes. PLUS KURT’S KITCHEN, a DVD with step-by-step instructions on how to think about food and improve eating habits.